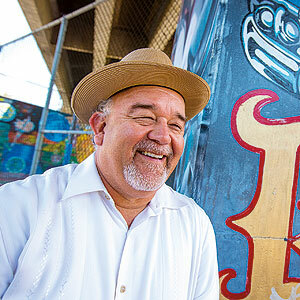 Alberto López Pulido grew up along the border communities of San Diego and Tijuana. From a very early age, his parents instilled in him the value of educación, which was honored in the Chicano communities of the southwest where he learned the importance of ethics, family and building community. He went on to acquire degrees from Southwestern College, University of California San Diego, and the University of Notre Dame. Today he is a professor in the Ethnic Studies Department at the University of San Diego. He has extensive research and teaching experience in the areas of Chicano/Latino Studies, Ethnic Studies, Border Studies, Chicano Literature and Higher Education. Dr. Pulido was inspired to document the history of lowriding in San Diego and the borderlands after teaming up with co-producer and long-time lowrider Rigo Reyes.